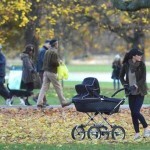 Kate Middleton took baby George for a stroll in London’s Kensington Gardens. Not sure, but I believe she was wearing a pair of J Brand jeans and – whoa – a baseball cap and Adidas sneakers. She kept herself warm in a Barbour Jacket and a grey sweater. But the thing that most called my attention was this royal baby stroller: a Sliver Cross Sleepover Elegance Stroller, which only costs about $2.300! !